Our Price NOW ONLY £10.99 - On your doorstep in less than 48 hours. Private UK Practice Sick Note. DoctorsNoteStore.com have been making fake Professional Documents for the UK, New Zealand, Europe and worldwide for the last 11 years. Started in 1997, we are the fastest, most reliable provider of quality, effective fake professionals documents on the web. Why risk your money elsewhere? DoctorsNoteStore.com have over a decade of trading history, and you are guaranteed to get what you order in the shortest possible time. Our years of experience tells us what works in the real world. We are experts at fake printing & design. You can be confident that your Fake Document will do the job you require of it. A range of features that make our fake documents look real, which lend added authenticity to the documents. All our doctors stationery is quality BOND PAPER (exact same quality as that used in hospital, doctors surgeries, etc.) produced on high definition printers, costing many thousands of pounds sterling each. HDP printers offer durability, exceptional print quality and an overall impression of quality and authenticity in our fake documents. We know that good quality printing is not all it takes to produce a good quality fake document. We take great care in the production process to make sure the design is believable, and an exact replica of any office's headed paper as necessary. Excellent Medical Professional Language used in our fake notes from Doctors. All documents are shipped from our offices the same day the order is received. We are the only fake document website in the UK or Australia to offer such a rapid turnaround on fake documents. Why risk sending money to a company with no trading history? We have been in business for over ten years, and you are guaranteed to get FAKE DOCUMENT if you order from us. Fake Prescriptions - that's fraud! All documentation is of the highest quality available and meticulously prepared to your explicit instructions. 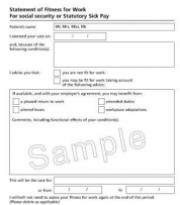 All our documents are computer generated on industry standard premium forms and are on approved National Health Service forms. We never divulge client information with third parties and we never sell or rent your personal information to anyone. We ALWAYS delete your details within 48 hours unless specifically asked to. You can place your order with total CONFIDENCE. One thing YOU the client must be wary of: companies without a terrestrial postal address, and/or just and answer phone. Why do they have to hide?? Bone fide companies always have a postal address and someone at the end of the phone. We have nothing to hide and some customers come to our offices to collect their orders. We are not a one man band - we have 2 employees and are part of a privately owned group of companies. All orders are sent via 1st Class Royal Mail or Special Delivery.